For those who cannot see the photo attached to this post, Marta Diaz Rondon is sitting on a stool with her fingers in a V shape. The “V” represents “victory”. Her eyes are black and can either make you fall in love or feel fear. Up to that point, the description could very well fit any woman. But when one looks down you can see her thighs, legs, and arms are covered with bruises. These marks are the results of a beating given to her by the experts of the Cuban political police on October 31, 2010 in the town of Banes. 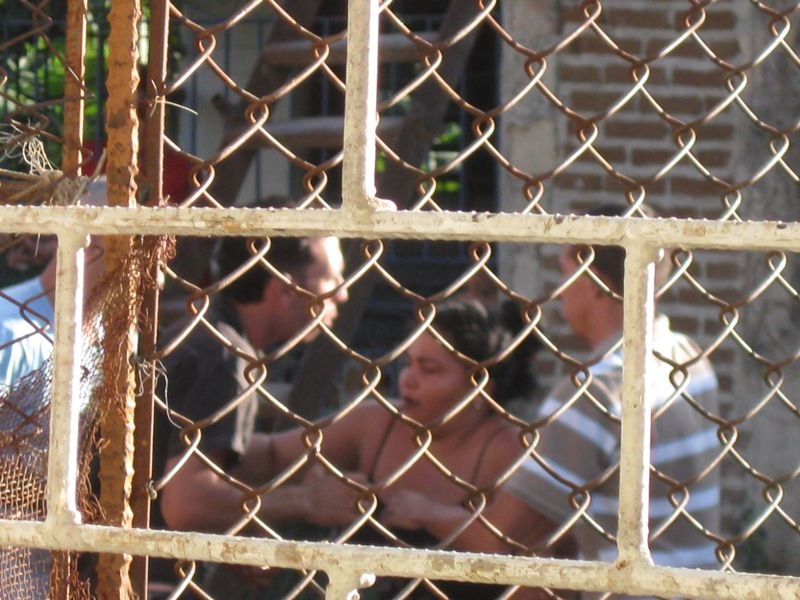 Marta was imprisoned in Holguin, and upon being released she went over to the house of her friend and sister, Caridad Caballero Batista, and that is where I took these photos. A few days later, she told me about the beatings. The culprits were men, although some women also took part in her mistreatment. However, the actual physical blows were given to her by men — those same men who claim to be patriots and protectors of Cuba’s security. Majors Freddy Aguero Allen and Wilson Ramirez Perez had already mistreated her once, along with Caridad, inside a car with music blasting on the stereo. This all occurred in Banes, the land of the poet Gaston Baquero y Antilla, and the very same place where it is said that the Virgin of Charity first appeared. If I were to bump into any of these “men” in any of the torture cells or interrogation offices, I’d ask them about the perverse beatings of these women which occurred behind tinted windows and with reggaeton background music. Despite the beatings, each week Marta continues to walk 2 kilometers from her house to the home of Reina Tamayo Danger to accompany her to the church and to the cemetery. Between the old La Guira cemetery and the historic Banes monuments of the Republican era there now lies a trail of blood, of abuses, and laments of defenseless pro-democracy activists who, one day, will really frighten their oppressors. But it will be the fear of truth, as is shown in this photo, and which is always present in the words of Marta and many others, who both accuse and forgive at the same time. There will be many voices working in favor of that country which was lost one day… in what century? The Nineteenth? Twentieth or Twenty-first? Who knows. I met Pedro Cruz Mackenzie when we were both taking university prep classes. It was during those difficult years which came to be known as the Special Period. In between classes we would entertain ourselves by collecting oranges, bananas, and any other source of food we could get to ease that hunger which was so common at that time. His academic talent and his skills for “sneaking” into math and chemical experiments earned him much fame in that place. Upon finishing the course, he was one of the recipients of a Medical scholarship. Many years later, our paths once again crossed. He did not become a doctor, and he was not able to become a faculty member of any university. He soon grew tired of so much misery, of getting to class with ripped shoes, and of not counting on any real support to inspire him to study. He abandoned his strictness midway through his Cuban university career. Now, he clandestinely sells merchandise on the beach, he gets his hands on any souvenir that he can, trying to sell them in order to purchase clothes for his kids. Whenever the opportunity arises, he runs errands and delivers merchandise from one place to another. However, he has also joined the struggle to denounce Human Rights violations in Cuba. While the police have him under constant watch, he denounces Cardet, the chief of the Police Sector in the neighborhood of Melilla in Santa Lucia, Holguin. Cardet is a soldier in charge of prosecuting disaffected youths, and Pedro tells me that, in conjuction with the president of the Committee for the Defense of the Revolution (CDR) of Yamagual, he has taken note of all those young people who “don’t want” to work agriculture or construction for 8 hour days for just 6 Cuban pesos. The officers claimed that such youths will shortly go to trial. “I don’t have the list of all the names, with myself included,” Mackenzie tells me on some notes written on a yellowish paper, “some are too scared to give me their names. But as soon as I find them out, I’ll send them to you or tell you over the phone — you can be sure of that,” he concludes. The thing is that my friend from back during the difficult years, Pedro Cruz Mackenzie, lives at the entrance of the Tourist Pole of Guardalavaca, in Holguin. This Pole is a special reserve for foreigners who decide to vacation in this area of Cuba. The strict police control, the lack of employment for those who are not trustworthy enough in the eyes of the regime to be able to work in their hotels, along with the sharp contrast in lifestyles between hospitality and tourism employees and those who do not have access to such currency or tips given by tourists is a very difficult and incomprehensible fact. “If something happens to me (he is referring to being jailed) please denounce the situation quickly so that my wife and kids can be visited by some of the Human Rights people,” that is one of the final phrases written in the letter by my friend Pedro, another one who has decided not to wear the shackles of this modern slavery. This happened to me a few days ago, on January 12th. I wandered about the city in the middle of the heat, searching for a good photo to take to upload on the blog. 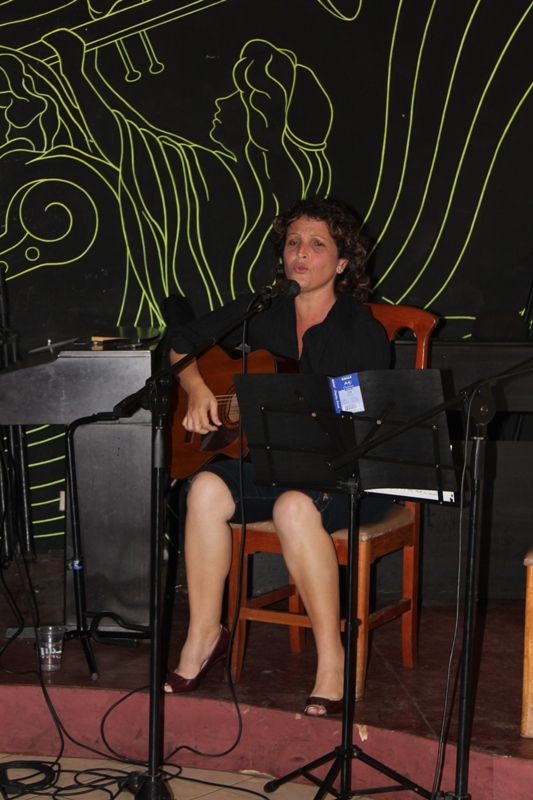 That was when they informed me that my friend, Ivet Maria Rodriguez, was going to present her CD at the Piano-Bar. So I head out over there. It was really a splendid afternoon, surrounded by friends who I have lost contact with years ago, or who have simply avoided me so they would not be contaminated by that ideological leprosy that comes attached to being a “public and open” dissident in Cuba. I have known Ivet for many years — ever since she would grab her guitar and sit under the shade of a tree and start coming up with songs or poems for the sugar-cane factory workers of her town, Baguanos. I met her in the midst of a moving and fantastic moment. Ivet was singing while the workers were walking towards the sugar-mill under the blistering sun. Ivet was singing, “don’t look at me that way/ because my skin is not made out of wood”. Suddenly, a mulatto who smelled of the fields was also staring at her with a saddened face. Meanwhile, he was piling a bunch of sugar-canes which had been left behind by the Sugar-Mill workers, all the while staring at Ivet. That same afternoon of the 12th, she was singing in the aseptic room of the Holguin Piano-Bar. Her songs seemed as if they had just been composed. Various years after writing and producing her songs, and after an eternity of having recorded this disc, she finally was able to offer the music to us. The CD is called “People of Faith”, and it has taken so long to put out there because Cuban musical production works one way, promotions work another way, and neither of them have any clue what the “market” is. What I have been able to do is translate, to the best of my ability, the words of Jorge Luis Sanchez Grass, who was in charge of the CD’s presentation. And it’s true, in Cuba it is very difficult to conciliate the reality of making a disc with the desires of promoting an intelligent and worthy song. Which record label takes its chances on controversial singer-songwriters like Frank Delgado or Pedro Luis Ferrer? Purchasing a CD which has just gone out to the market may cost you up to 400 pesos, or else you have to wait years until it’s out of circulation and then they can sell it to you for 30 pesos in national currency. Ivet opted for singing poems written by poets from her own village, like Luis Martinez and Orestes Gonzalez, repeating those lyrics with her sweet voice, “Listen to the tunes of your daughter/ If desperation falls all over you”, which is a song written by her friend Fernando Cabrejas. This is not a Havana-style CD. It has not even been passed through theaters or small spaces reserved for “trova” in Cuba. The interesting fact is that it was recorded in the house of a good-willed friend, a singer-songwriters named Jose Aquiles. 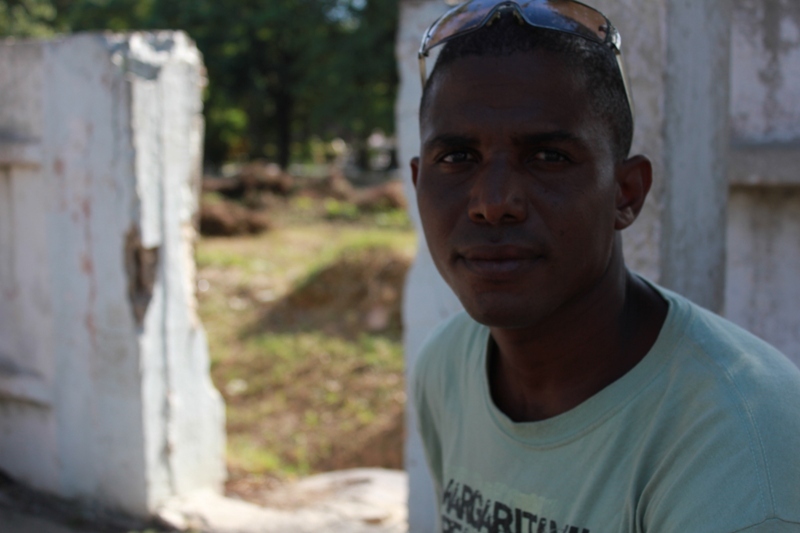 Aquiles has his own “studio” built up on a hill in Santiago de Cuba, and with the very little that he has he helps out other singers, rappers, or other musicians, to realize their dreams of having their very own records. This disc is a truth which saves that other country of ours — the Cuba which does not come out on our newspapers. This afternoon, I went out to drink some rum with my friends, some who follow this blog, and others who actually believe in Marxism. I extended my hand out to a public functionary who once attacked me for publishing an independent magazine (“Bifronte”). I applauded Ivet next to the poets Rafael Vilches and Rolando Bellido, who are both good friends of mine for different reasons, yet who are nonetheless loyal friends. Among the things that I appreciate from that afternoon, after the songs of Ivet of course, was that future Cuban picture I saw — where one is not going to get stoned for thinking differently. There were writers there who I would not exclude tomorrow, if I were an editor, just because they believe the words of Karl Marx or Paulo Freire. Those friends, in the Cuba I dream of everyday, can make a magazine, a recording studio, or a documentary, without having their houses sacked by the police. Their names will not be hung up in the public light with a “warning” sign on them, as if they were portraits of national shame. The songs of Ivet served for stirring up good conversations that night: and the language? Almafuerte, Neruda, Roland Barthes, life. I am sure that any Cuban would give a fortune to find out the name of the general from the Ministry of the Interior who gives orders to sign the Exit Permits, or the “White Cards,” as these documents which determine whether Cuban citizens can leave their country are popularly known. I would give more than what I have to know the exact names and inclinations of those who restrict movement for hundreds of Cubans within the national territory. Since I have fruitlessly looked over those paragraphs within the Penal Code and the Constitution which prohibit me from entering Caimanera, Banes, or Placetas, I turn to my readers. If any of you have information about this, you are more than welcome to let me know through this blog. 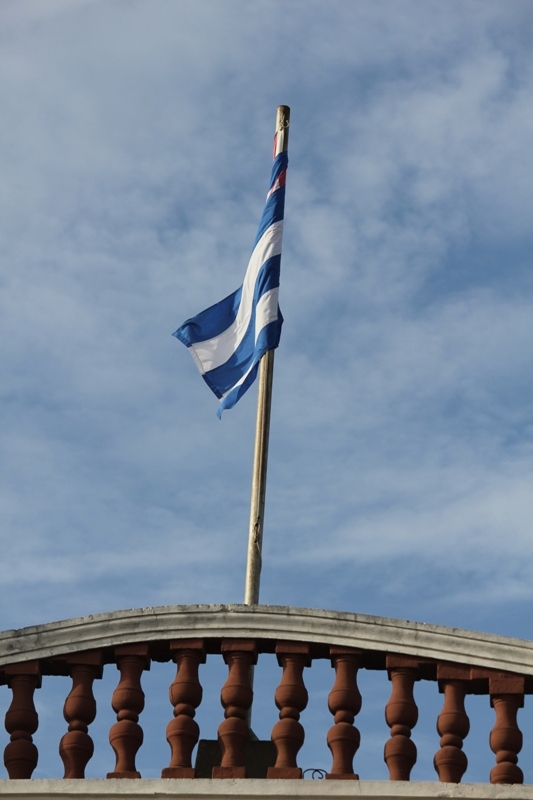 The absence of Guillermo Farinas in Strasbourg and of Yoani Sanchez in Sweden were reported with all the force of the media and communication sector of the digital era. I dream of the day when permits for entering any town will just be an obsolete ruse. Why can’t Roberto Bartelemi Cobas and Yoandris Montoya Aviles visit Banes, home of the poet Gaston Baquero and the musician Juan Blanco? Who impedes Marta Diaz Rondon from going from Banes to Santa Clara (the city of Marta Abreu)? Under which decree should the son of Raudel Avila Losada, of Palma Soriano, present a safe-conduct in order to spend the night in the house of Caridad Caballero Batista in Holguin? These are only some routes of internal prohibition. The process of deporting Eastern natives living in Havana back to their hometowns has been more than denounced. 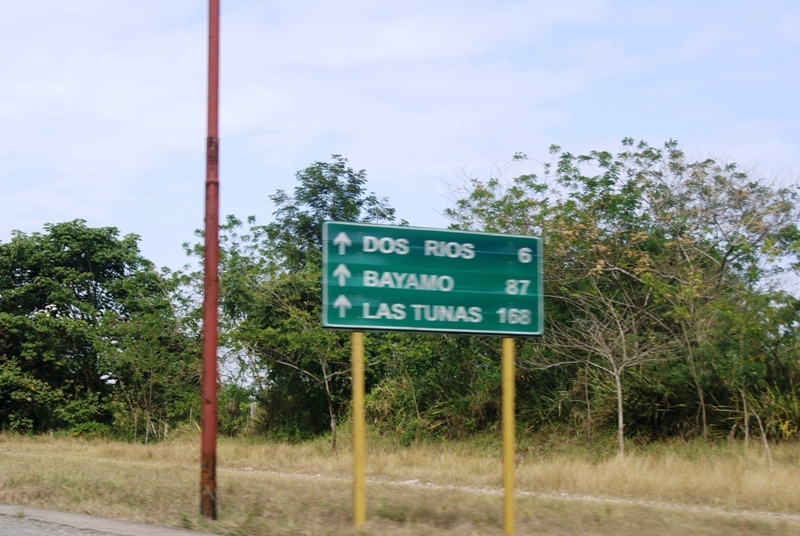 However, each week the security check points send back those who go from Contramaestre to Jobabo in Las Tunas, or from Moa to Banes in Holguin. But does this happen to all Cubans? No, it only happens to some dissidents who are singled out by their high levels of civil disobedience. Sometimes we are shocked as we read accounts of deportations described on major media outlets, yet we don’t have the time to look at all the gags which take place nearby us, in the most obvious of places. Several days after my previous detention in that Eastern Cuban city, we were finally able to make it there without the usual “security” obstacles. Although they did require identification of all the men at the Point of Control at the entrance of the city, my family and I were able to pass through without difficulties. 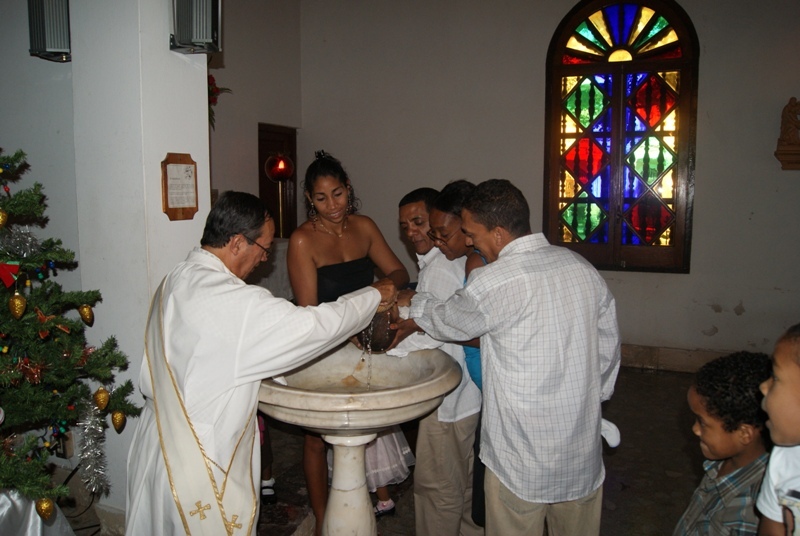 In what seemed to be a wholesome ambiance, without the presence (at least it was not visible) of the police, Rolando Rodriguez Lobaina’s kids received the holy water which consecrates them as baptized children of the Christian faith. The event took place at 3 pm on Sunday, November 19. Was there some reason for obstructing us a few weeks ago? What order came from Villa Marista or from the general barracks of Guantanamo which demanded that my family be sent back to San German while I was taken to a dark and wretched cell? Should we believe that it was “just an error”, as they told Rolando Lobaina? What is certain is that an attitude such as the one in the city of Guaso continues making that area one of the most repressive zones in the entire island. Every single human action serves as an experience. This one served to reaffirm my faith in Jesus Christ and in the day that freedom arrives in Cuba. I would once again go through all the fiery doorways, all the cells, and the corporal punishments if that meant I will be a free man. It is my belief and it is my faith, just as it is the belief and faith of many others. That day in the principal Catholic church of Guantanamo, it seemed as it was the day after the fall of the dictatorship. It was a sign of the days soon to come.